Originally from Chatfield, Minn., Tony Peterson began his outdoor writing career while attending college in Winona. Since graduating, he has written hundreds of articles for over two dozen national and local publications. 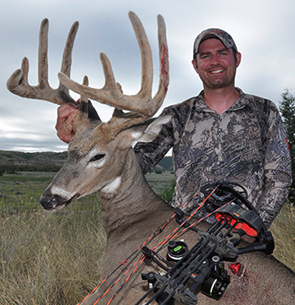 Although he covers topics related to all forms of hunting and fishing, his passion lies in do-it-yourself bowhunting for whitetail deer and western game. In addition to his freelance writing and photography for Outdoor News and other publications, he currently serves as the equipment editor for Bowhunter Magazine and Bowhunter TV. At the Outdoor News Deer & Turkey Classic, Tony will be presenting “Hunt The West – Traveling in Search of Do-It-Yourself Hunting Adventure” and “Public Bucks – Tips for tagging out on tough-to-kill whitetails”.